This is review No. 8 of 16 in the first round of our competition. 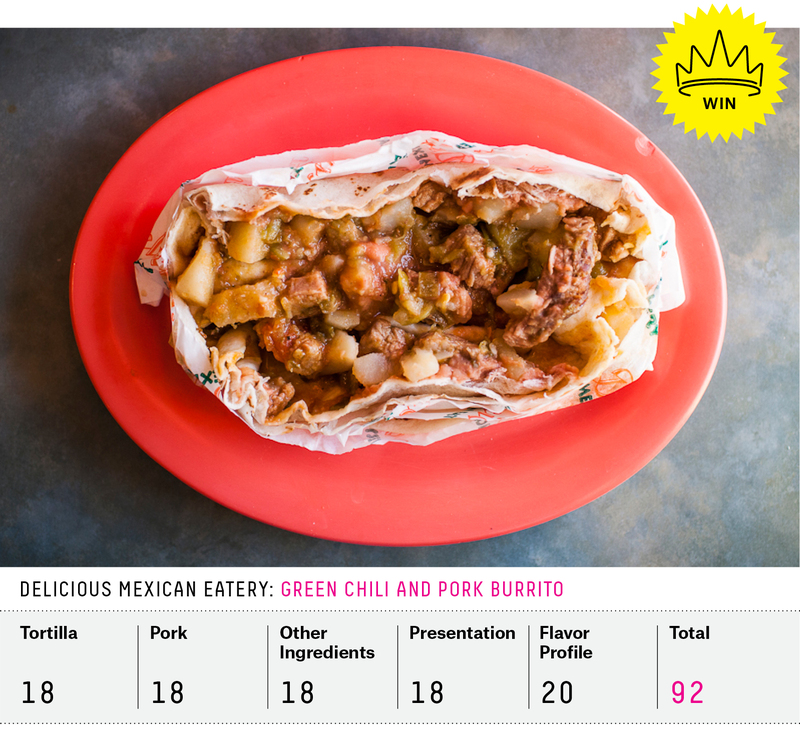 Each review will compare four burritos, with my favorite advancing to Round 2. The final competition in the West is a face-off among restaurants from the far corners of the region, from Kalua pig in Hawaii to green chili and pork in El Paso, Texas. I landed at the airport in Honolulu, my first time in Hawaii, and headed straight to the marketplace in historic downtown Haleiwa on the North Shore of Oahu island. Tchotchkes at the airport’s shops spoke the joys of “island time,” as had the websites for hotels and rentals I’d seen before I came. Although I was in a hurry, just 36 hours on the island, I was determined to slow those hours down and make the most of them. I broke out of the oppressive Honolulu traffic and made it to Haleiwa. The air was warm and thick with humidity, slowing me down already. 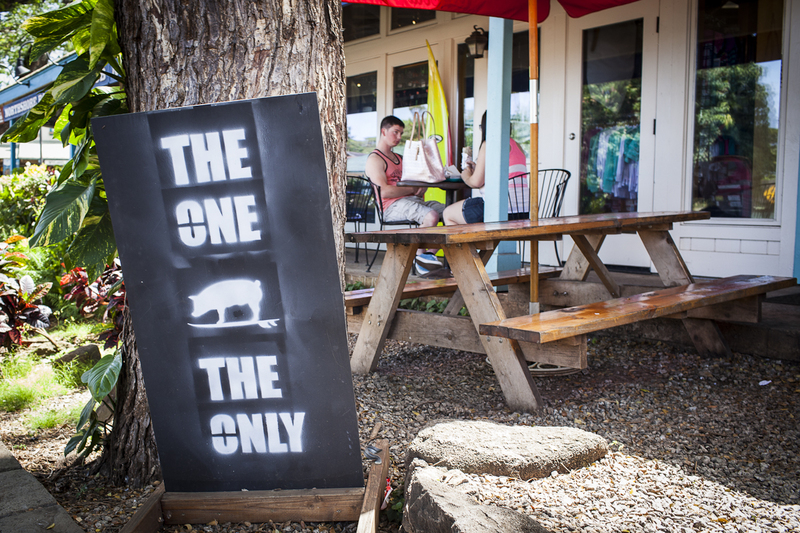 Inside Kono’s, surfboards from the young all-stars of the North shore (John John Florence, Kiron Jabour, Eli Olson) hang on the wall, with handwritten dedications to the restaurant and its stellar burritos. A giant blackboard behind the counter describes the menu, and a pulley system takes order tickets from the counter to the kitchen. I ordered a lemonade and a Pig Bomber. The lemon juicer was broken, so there was no lemonade. The receipt machine was broken, too, though I was probably the only patron in weeks to request a receipt. Kono’s was out of iced coffee as well, so I settled on a milkshake, which came in tropical fruit flavors and the standard chocolate, vanilla and peanut butter. I took a seat outside and waited. When a voice on the 1950s drive-in-style microphone called out for “the person who ordered a shake a few minutes ago,” I went inside to find out the restaurant was also out of ice cream. It seemed a small price to pay for island life. Who was I to be frustrated? I was there for the burrito, which made it to my picnic table without incident. The Pig Bomber was filled with burgundy shreds of kalua pig, caramelized onions, sweet and tangy guava barbecue sauce, jack and cheddar cheese, and plain rice. Unfortunately the distribution of ingredients was a bit erratic, meaning too many bites of plain rice, but the combination of flavors was magical where the fat, round rice kernels had soaked up the bright guava and kalua juices. 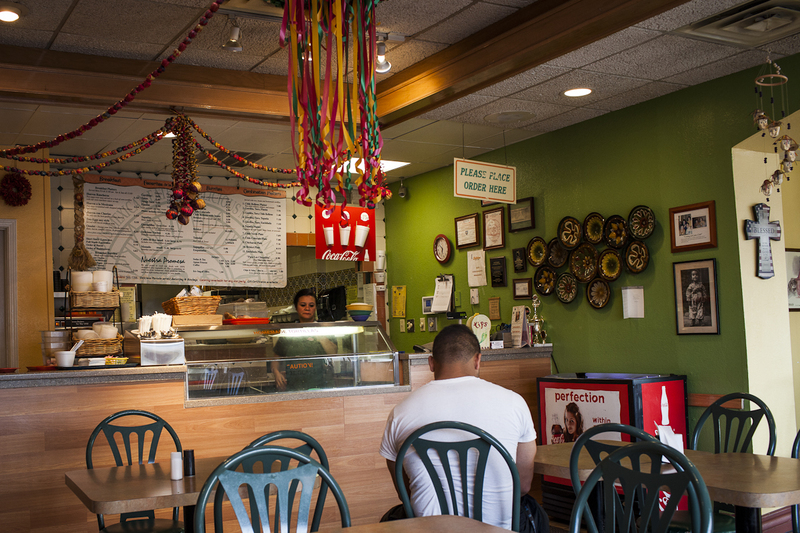 After nearly two weeks in the land of expertly handmade tortillas, the run-of-the-mill tortillas at Kono’s were clearly utilitarian, and although they did little to enhance the burrito’s flavor, they were better than most grocery-store varieties. The salty shreds of kalua pig were offset by the sweetness of the onions and guava barbecue; even now, back on the mainland, I can close my eyes and taste that flavor combination. I ate at Kono’s again the next morning, to try a breakfast burrito, before returning to Honolulu to catch my flight. The Breakfast Bombers are stuffed with gobs of fluffy egg, kalua pig and heavily spiced potato; I added avocado for good measure. I can understand why it’s a favorite among surfers in need of a heavy dose of calories, but it’s also delicious. Like so many, it started as a taco truck. Rancho Bravo then added a brick-and-mortar spot in downtown Seattle, taking over where a fast-food chain had been. Employees use the old drive-thru, indicated by the wraparound driveway and remnant “Clearance 8’ 10” ” sign, for parking. 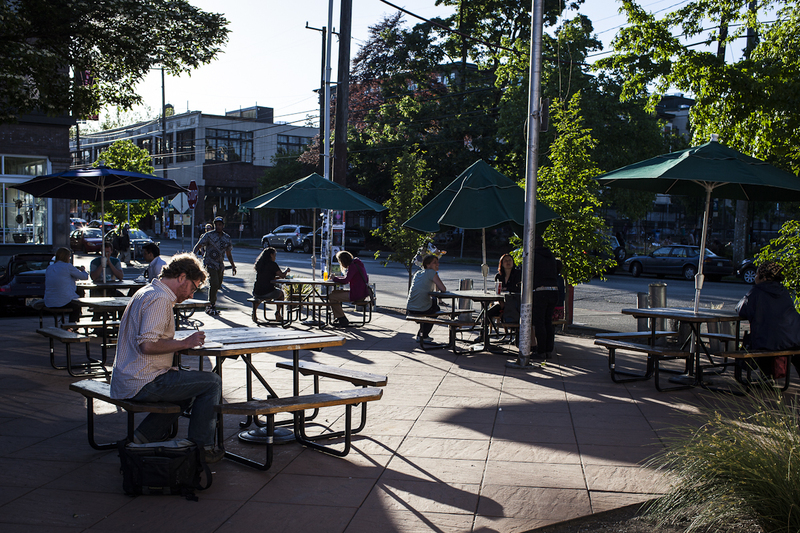 For several blocks in either direction, hip bars and coffee shops line the street on one side and a lush park sits on the other; Rancho Bravo seems to be from a different era. There was no sign anywhere on the building indicating the occupant, but judging by the crowd, its location is not a secret. The Pacific Northwest knows Asian flavors almost the way the Southwest knows Mexican ones. It seems like there’s bàhn mí on every block, pho on every corner and hand-pulled Chinese noodles available 24 hours a day. It’s not the same with good Mexican food, and our Burrito Selection Committee struggled while choosing a burrito in Oregon or Washington. Online sources varied wildly: Some lauded Rancho Bravo as the real deal in an area with few options, but others begrudgingly accepted it as good enough only to sop up the alcohol at the end of a long night. I had no idea what to expect. I placed my order and walked toward the end of the counter to pick out salsas. Before I had time to make sense of the four on offer (two red, two green — a hot and mild version for each color), my order was ready. It couldn’t have been more than 30 seconds — impressive, though slightly disconcerting. I got a tiny paper cup of each salsa and took a seat at a table outside to catch the last sunbeams before the night cold set in. 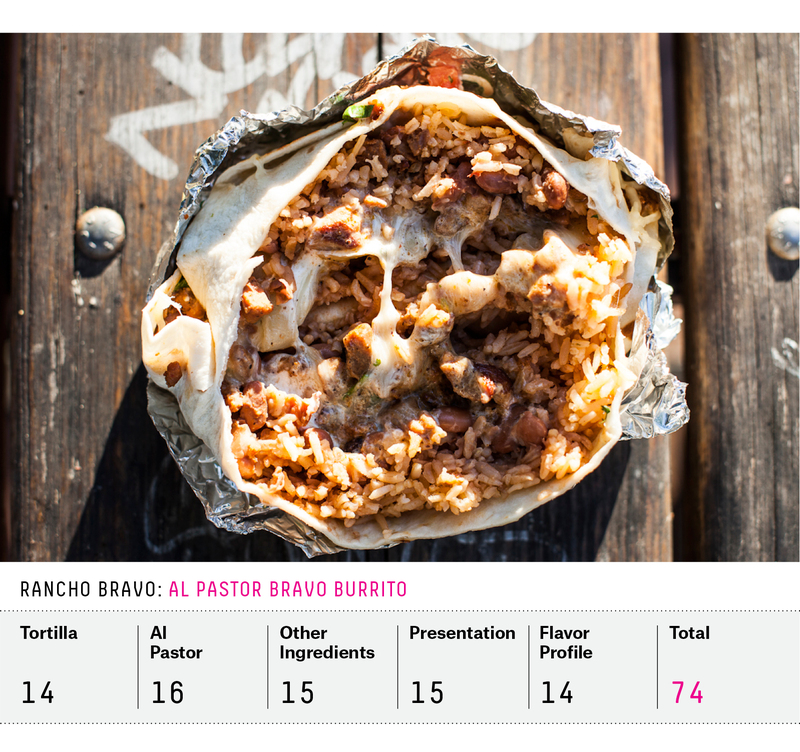 The Bravo Burrito comes with sour cream, grilled onion, cheese, rice, pinto beans, cilantro and tomato. I ordered it with al pastor, which was cut in tiny little cubes and charred all around. It was also salty, and I’m not sure where the pineapple in the marinade disappeared to, but I washed each bite down with naturally sweet agua fresca de piña, so I didn’t miss it much. The tortilla was griddled, but the burrito started to fall apart before I was halfway through. The grilled onions were brown and flavorful, the pintos flush with juice but heavy on the salt and a little mushy. Joel’s is 60 miles south of the border. But it’s the Canadian border, so good Mexican food isn’t abundant. Sandpoint is a quaint ski town that hibernates in the summer heat. It’s also spectacularly beautiful. Located on the edge of Lake Pend Oreille and surrounded by mountains in gradient blues, there’s a view in every direction. I arrived in town late and slept in a cabin by the lake. I woke up the next morning with a time-zone hangover, threw on the remaining clean clothes in my suitcase and headed to Joel’s early, because it’s only open from 7 a.m. to 4 p.m. I chatted with the folks at the register about the best ordering options, settling on a few burritos, then went to order a coffee from a different register in the opposite corner of the room. The young man behind the food counter called out to me, “I put your name down as ‘denim.’ ” I looked down to find I was inadvertently wearing my best Canadian tuxedo and wondered whether it was time for a break from the road. 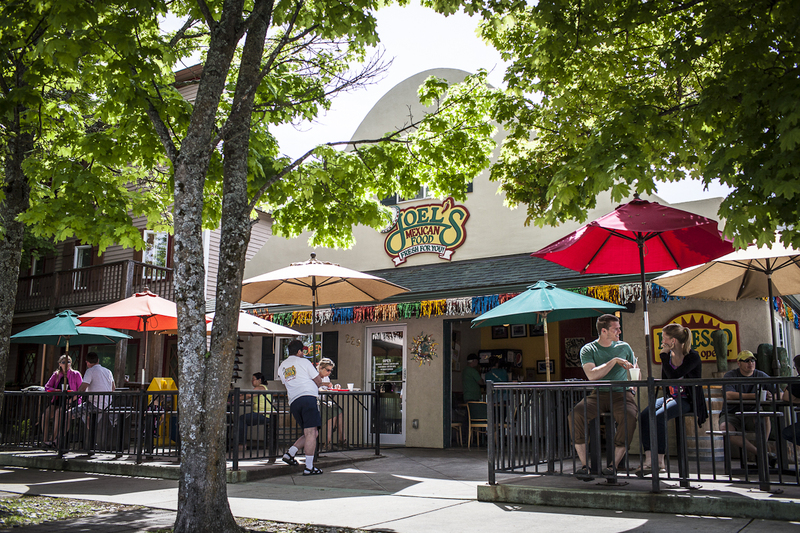 Joel’s is housed in a building with an adobe façade shaped in a Spanish mission style. A garagelike entrance opens onto a wraparound outdoor patio. The weather was sensational on the day I visited, crystal-clear skies and a cool breeze off the lake, but I get the sense that’s the default in Sandpoint. Inside the restaurant are a couple of tables near the order counter and a small side dining room with a sliding service window onto the kitchen. My burrito came, and it was pleasantly small, just steak, cilantro, salsa and guacamole inside. The homemade tortilla was lightly dusted in flour. 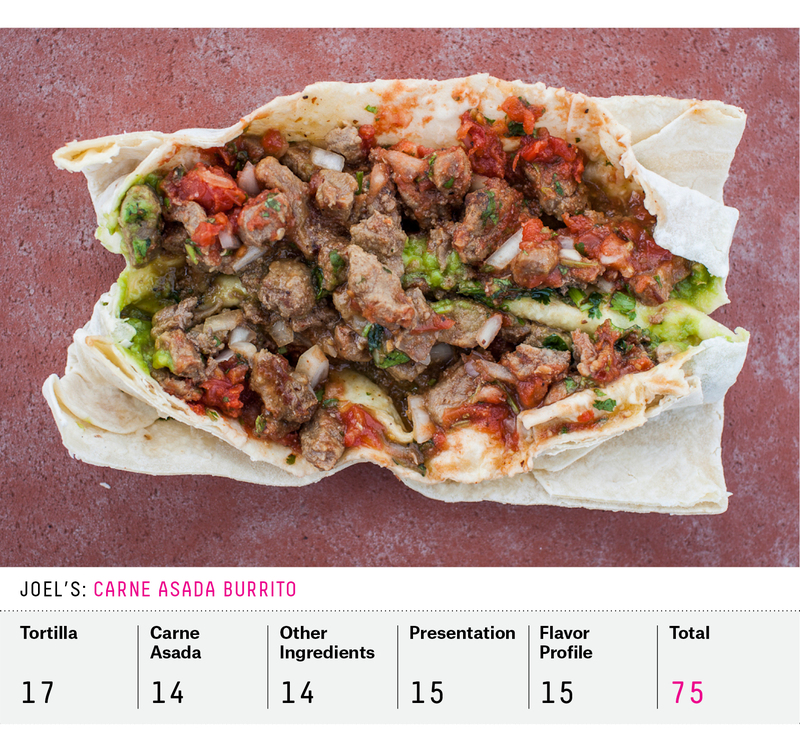 Online, people rave about the vegetarian burritos, so I tried versions with tofu and just vegetables, but the carne asada, a high-quality steak with a hint of chili seasoning, was the tastiest option. The salsa inside most resembled a pico de gallo, with chunks of fresh onion and cooked tomato. My main gripes were that the guacamole was thin (a flaw of the quality of the avocado) and that an odd bitterness hung over the flavors. Still, it was tasty, and I would guess the best burrito for hundreds of miles in any direction. I visited El Paso after a busy day of eating in Ciudad Juarez, Mexico. Although the two cities lie directly on either side of the Rio Grande and share a history and culture, there are vast differences in the food on either side. The south-of-the border burritos were extracurricular, but the visit turned up a couple of notable differences: All six burrito joints that I visited in Mexico offered mole, which I didn’t find much of on the U.S. side. There was also a notable difference in the flavor of dairy products (cheese and crema); the Mexican versions were much more flavorful and creamy, likely a result of Food and Drug Administration regulations on pasteurization in the U.S. Both cities serve burritos that are thin and rolled, rather than stuffed and folded. When I got to the boldly named Delicious Mexican Eatery, it had a dozen metal tins filled with an array of saucy meats and fillings for the house-made tortilla. I chatted with the woman behind the counter, and she handed me small paper cups of various fillings until I found the right one. What I chose was essentially a stew of green chili, chunks of potato, fatty roast pork and tomato. I ordered it with beans, which added a layer of density and creaminess. They were spread inside the tortilla and topped with the stew; the ends were folded over one another, and the burrito was ready to eat. Like all good stews, this had been made in the morning, the flavors mingling for hours to create a bouquet. The potato was soft and rich with the juice of the pork. Rolled burritos are harder to eat. I liked that I could eat multiple burritos in a sitting, but I hated to lose any of the breathtaking stew to the wax-paper-lined tray below. My eating companion, a California native who’d never enjoyed the simplicity of a border burrito, told me it made him rethink what a burrito is. 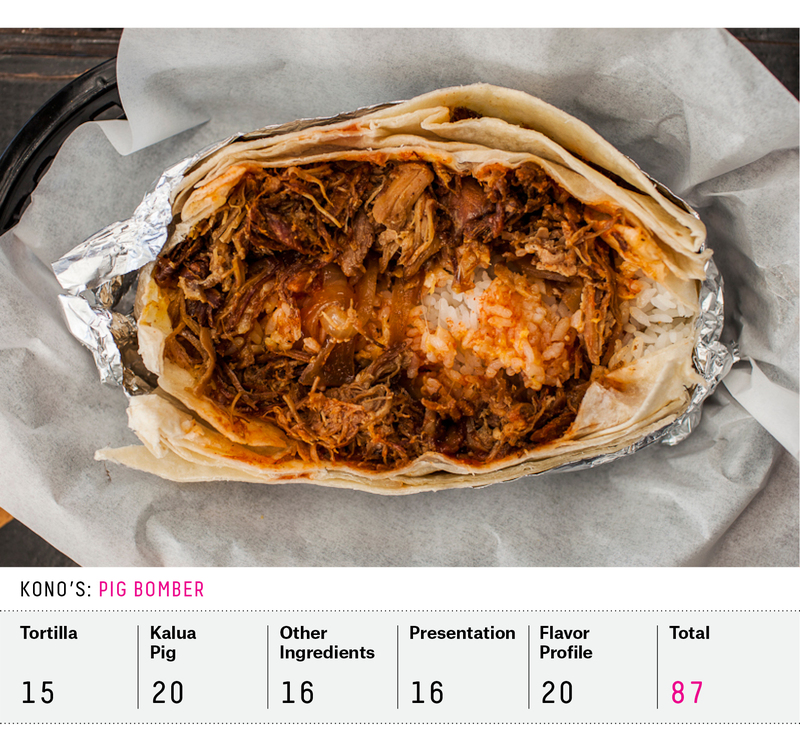 It was hard to say a final aloha to the burrito at Kono’s — the combination of flavors was delicious and refreshing. But Kono’s just couldn’t compete with the elegance and simplicity of Delicious Mexican Eatery, who takes this round.